Does your low-slope roof leak due to Ice Dams problems? Does your ridge vent leak, or did you have to completely remove the ridge vent to stop leaks? Poor ventilation and attic insulation is causing your ice dams, but now you can solve this problem efficiently and economically. An IB PVC Membrane is a solution that will keep your home, probably your biggest investment, watertight and ice dams free for decades to come! Most low sloped roofs in the northern United States have Ice Dams, which cause roof leaks and expensive roof repairs as well as cosmetic interior repairs of ceilings, walls, carpets and wooden floors. Those are the damages that you can actually see. Ice dams also create invisible structural damages, which you can’t find until you open up ceilings and walls. These damages are extremely expensive to repair, as it would require hiring interior remodelers to fix structural damages, outside and inside walls, electrical systems, plumbing, etc. Ice dams are caused by poor attic ventilation and heat loss from the inside of your living space. Large piles of snow will accumulate on your roof after a snow storm. If your attic is improperly insulated and ventilated, the warm air escaping from your living area into the attic, will melt the snow. The water from melting snow will run down the roof and refreeze, usually along the eaves of your roof. These are Ice Dams. The more snow is melting the bigger Ice Dams you have. After some time, the ice dams become so big, that the melting water cannot travel downward anymore, so it starts to travel upward underneath the roof shingles or rolled roofing seams. As it freezes under the roof, warm air melts it, and it slowly starts to drip inside the attic, causing all of the above and below mentioned problems. One negative effect caused by ice dams, and which many homeowners neglect to address is the wet insulation in the attic and inside walls. When insulation gets wet, you loose insulating value, so your energy costs increase, as heat loss in the winter drives up your heating bill. The same happens in the summer with cooling. Also, mold begins to grow in the attic and inside walls, which cause and/or aggravates allergies, asthma and other respiratory illnesses. An IB membrane is a perfect way to eliminate Ice Dams on a low slope roof, as it is a seamless blanket over the entire roof. 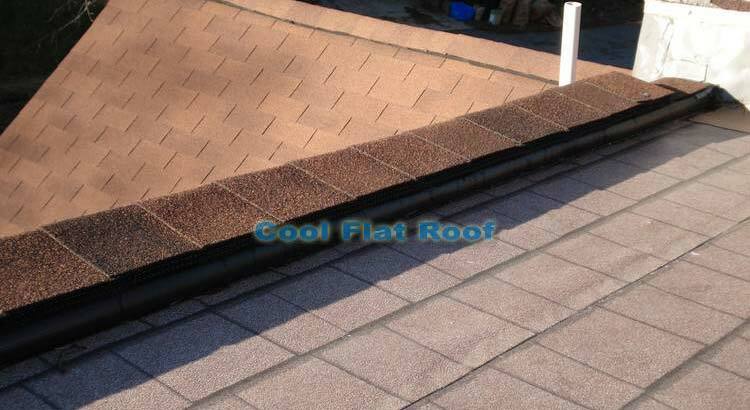 Hot air welded seams prevent water from backing up and re-freezing, as is the case with shingles and rolled asphalt roofing, therefore eliminating the effects of Ice Dams. Also, most of the snow will actually slide off the IB roof, thus there will be a minimal Ice and Snow accumulation along the eaves. Additionally, we’ve designed a special Ridge Vent system, which we use on every low-sloped roof with ridge/soffit ventilation in place. This system prevents the wind driven water from entering your attic space through the holes in the ridge vent, while allowing the warm air to escape the attic. Check out our special Low-Slope roof ridge vent assembly, which improves your attic ventilation and eliminates leaks! ridge vent i should install on our 3/12 roof with existing eave vents. your website mentions a low slope ridge vent method, but the link isn’t working for me !? could you please help…..i’m terrified that i’ll make a decision that will result in leak problems i’ve never had without a ridge vent! I am trying to find out more about PVC roofing. I live in Atlanta, GA and I had not heard about this type of roofing before. I am wondering if there are contractors in Atlanta that can install this type of roof. I am also wondering if it is cost effective. I had inquired into having a metal seam roof to fix my flat roof, but that was too expensive. Is the PVC roof less costly than the metal? Thank you for any information! I personally do not know any IB roof installers in Atlanta, but if you call IB Roofs at 800-426-1626, they will put you in touch with local certified IB installers. As far as cost effectiveness, it is a matter of perception. IB will cost more than a Rubber roof to install, but a lot less than metal roofing. Besides, unless you install copper roof with soldered seams, metal will not work on most flat and low-slope roofs. I do believe that IB roofs are cost effective. The initial cost is slightly more that competing flat roofing products, but it WILL last a lot longer and without any leaks (when professionally installed of course). You will save money on very likely roof and interior repairs, due to roof leaks. Therefore the premium you pay now will save you much more money down the road.